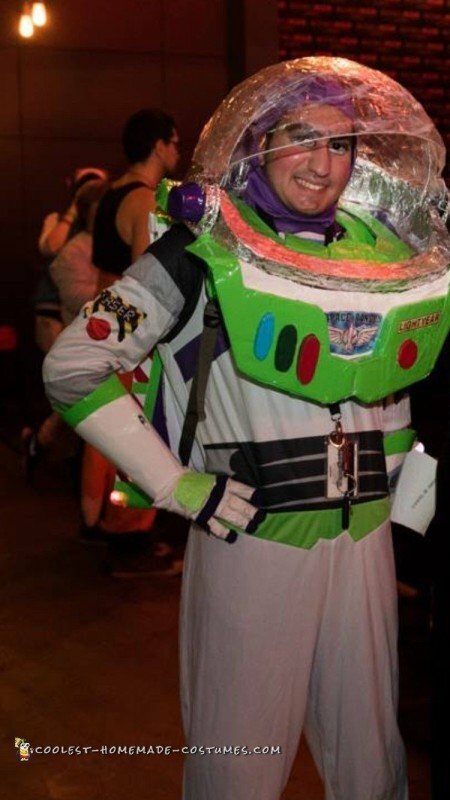 Buzz Lightyear has always been my favorite Pixar character since I was little. 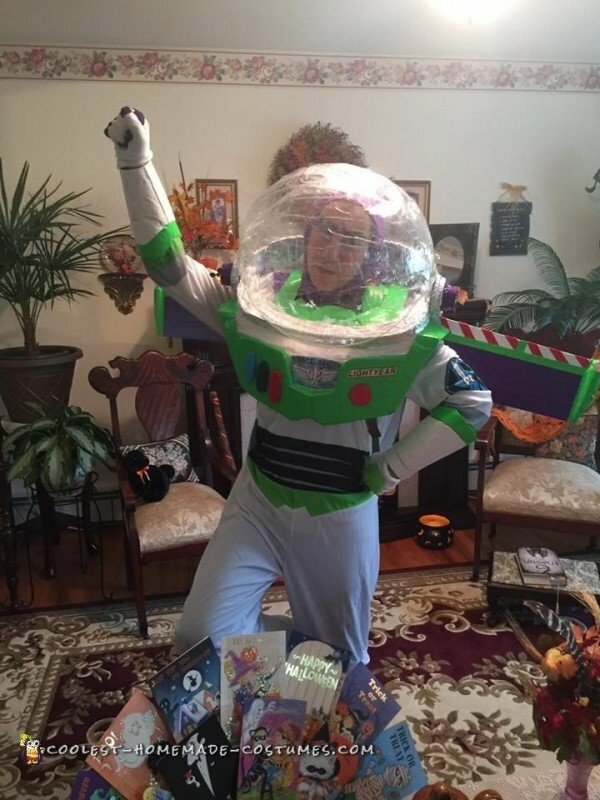 I was Buzz three times for Halloween when I was younger, but the costume I had was basic. The main story started when I finished watching the cartoon spin-off ‘Buzz Lightyear of Star Command The Adventure Begins’ towards the end of August. By that time I knew what I wanted to dress up as. I started with the arms first. The light for the laser is just a party favor my sister gave me. I found the stickers for the character online. The communicator’s just hinged by a chopstick (the communicator kept flopping up because I didn’t lock it properly). Both arms were constructed from cardstock. The gloves were just leftover pairs I had from my Sonic costume. 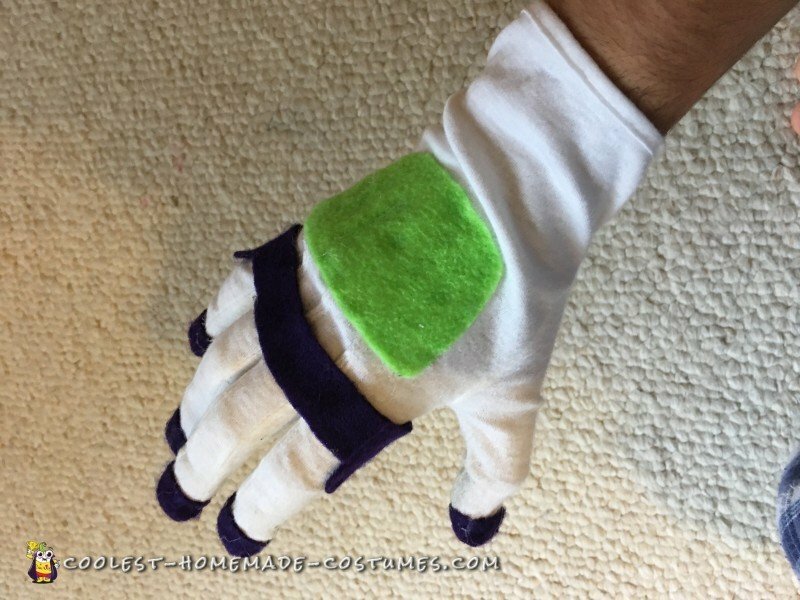 I hot-glued green and purple felt for his gloves. It took a lot of shaping for the fingers until I got it right. Next, I went on to work on his wings, my first attempt failed, the rubber band snapped (they were supposed to pop up like they did in the film). On my second attempt, I just used strings to pull up the wings. 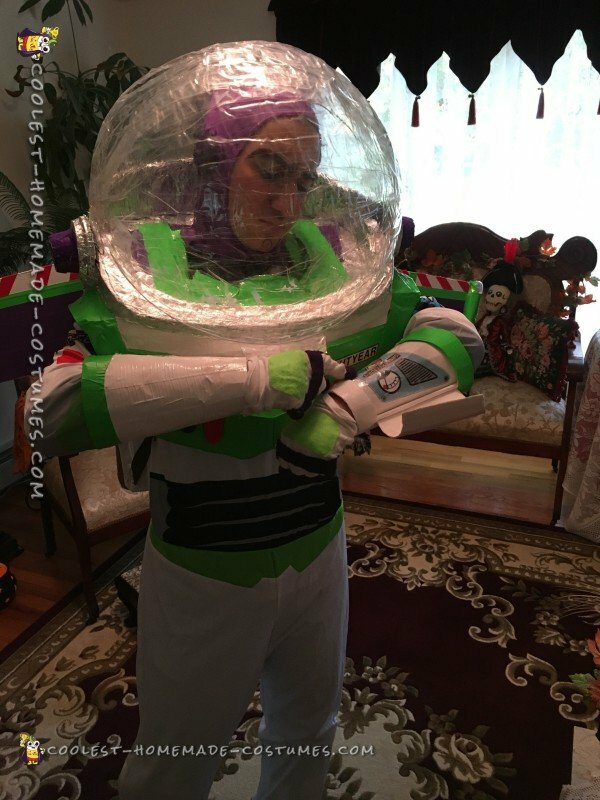 I googled different homemade Buzz costumes to figure out the shape for the backpack. It was a lot of cardboard sandwiched together. I used hooks to keep the wings up, they hooked on my backpack straps. I also put lights in the wings (small light up wands like the ones you buy from the dollar store), also I added mini capsules, the kind you get from the vending gumball machines, to indicate the bulb just like the toy. The helmet is just tape sculpture that I learned from a Sandy Checks entry on this site. I cut the helmet in half to make it retractable. I also used wire hangers to keep the helmet in shape. The chest piece was cardboard all shaped together. 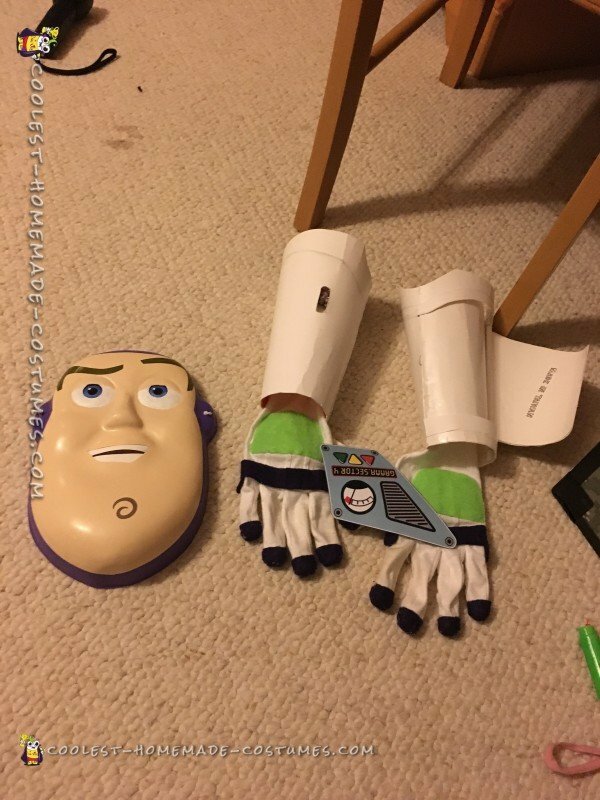 I also put a small talking buzz lightyear action figure for the phrases inside, positioned under one of the buttons so when pressed it will speak the phrases. The Jetpack button was just a big water bottle cap covered with duct tape. All the colors were done in duct tape except for the gray parts (aluminum foil), stickers, and the dark green chest button. The bottom legs (big plastic water Jugs cut in half to form armor) underneath they were strapped with elastics as if they were shin guards. 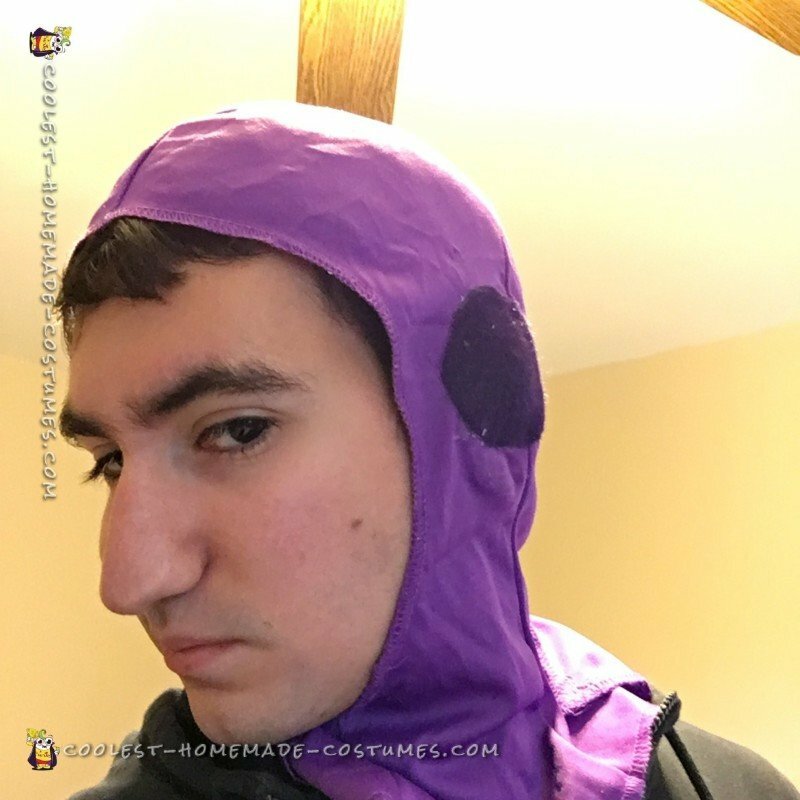 For the body suit, I bought a basic Buzz adult costume from amazon and made some alternate changes to the legs and the hood. 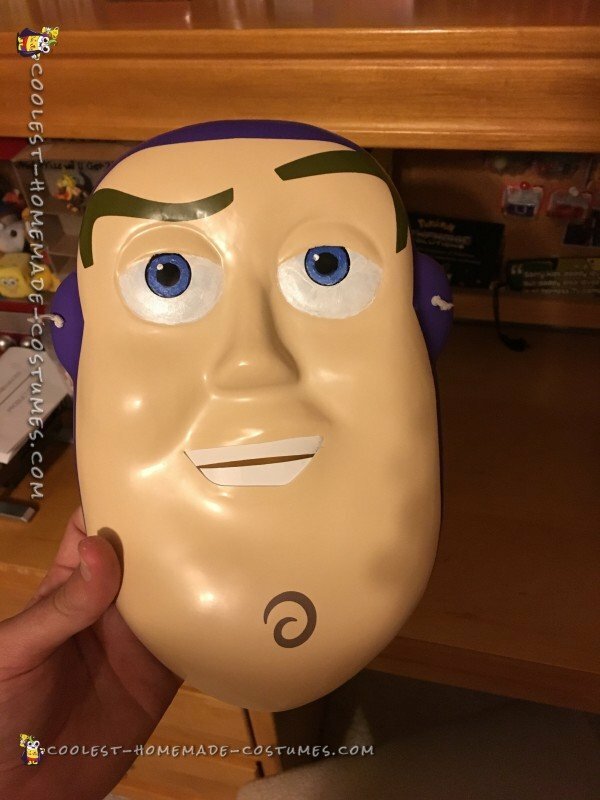 I was originally going to use a mask for my face but it limited my movements with my head, guess that’s why Buzz doesn’t have his helmet on in Disney World when he greets park guests. 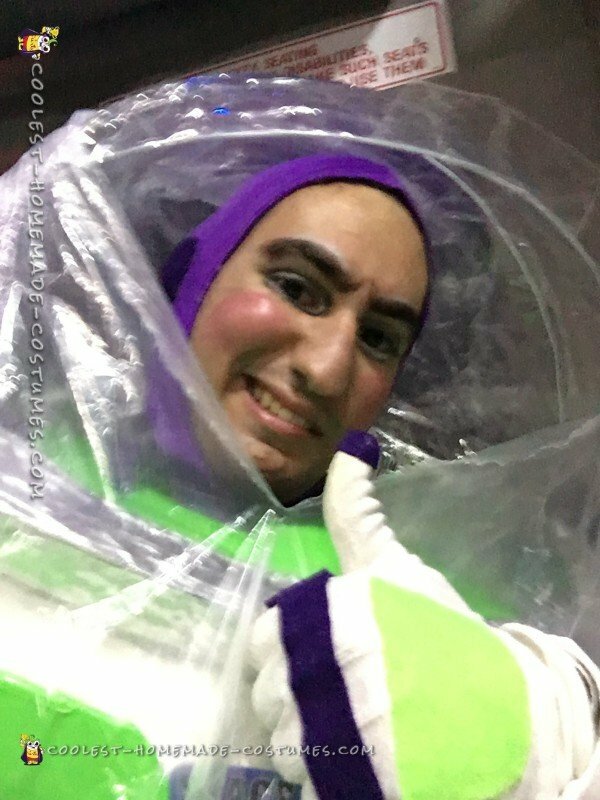 So I stuck with makeup like the Disney live actor does. The boot covers were last minute, they were done with masking tape and duct tape (found myself adjusting them every hour of the night). My costume was a hit at my school’s Halloween party, a lot of girls were asking me for a picture and asked me to show my laser. Everyone was asking me for poses. I even won second place in the costume contest. Once I got back to the dorm I was very disappointed that I had to take it off. 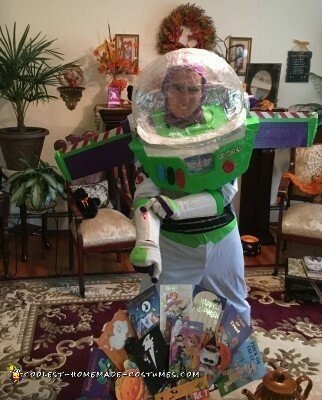 I hope someday I could use this costume again, maybe my cousin will give the twins a Toy Story Birthday and allow me to dress as Buzz. I’m thinking about adding his utility Belt from Toy Story 2 or maybe make a fake arm, an apron and a hat, Mrs. Nesbitt!! !